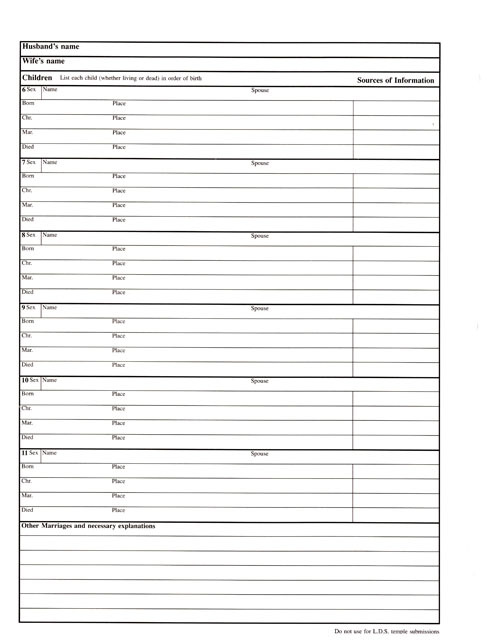 Forms – Stevenson Genealogy & Copy Center L.L.C. We are happy to provide this family group sheet FREE for you to download. It is a beautiful and useful chart that I hope you enjoy. We will add more charts and forms here over time. Thank you for providing this form. It will be a great help. Do you have catalog available? Do you publish any type of monthly Genealogy magazine that can be subscribed too? We don’t publish a magazine, sorry. We do have a small price list, but the website is much more complete and easier to use. Call us is you would like us to send a copy. Thank you allowing us to use your forms for free. I took over the family tree on my mother’s side after my grandma had passed. I plan on ordering additional forms and other items in the future. Your designs are one of the best I have come across. I even tried making my own but yours is far better than what I came up with. Again, thank you. Since some of my friends are starting their own family trees, I will definitely be recommending your business to them. Thank you for the family group sheet. Thank you for the free use of the Family Group Sheet! It’s great. And agree with other comments. I have been researching my Paternal family for the past 5 years. With the help of Ancestry and Ancestry DNA I have found at least 7 Fourth Cousins, and the 3x Great Grandfather to whom we are all related. I need a CHART that would allow me to start with that Ancestor, show his sons and daughters, grandchildren, etc. What can you recommend? That is great that you have found them. Unfortunately, we don’t have a chart that could help you. You could track them in a genealogy program like RootsMagic or just make a custom chart in Word. What you need is referred to as a descendancy chart. I use them in Familysearch.org where you are able to have a free account. I know the census forms are not free but are they all on colored paper or are they available in white? And are the long forms available on 8.5 x 14 or 11 x 17? I have seen the downloads elsewhere in which the long forms are split onto two separate pieces of paper. 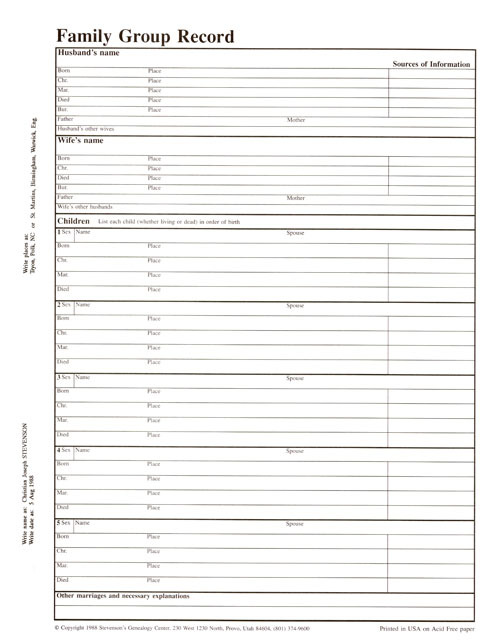 All our census forms are on 8.5 x 11 colored paper. We have included just the columns that are important for genealogy so they can fit on that size. Okay thank you. I will download them from the Ancestry site since they are on white paper. I find all the columns interesting. I love your store and have gone there scores of times through since the early 80s and am always so impressed with the products you have available. I haven’t been there in a few years now because I rarely have a reason to travel to Provo so I will have to make a special trip. P.S. – Sorry about the duplicate question – I hadn’t seen this answer yet. Please delete it if you can. I am wondering if my previous question about census forms will be viewed and answered and how long it takes.